What makes a neighbourhood peak hipster? Is it an amalgam of shops selling gourmet stuff, dimly-lit bars with Edison bulbs, quaint bookshops with indie titles, chic restaurants with buzzing rooftops and experimental galleries with 'gritty' art? If yes, the trendy brigade would easily overlook Humayunpur as a no man's land. A Jat village, right in the middle of south Delhi’s tony Safdarjung Enclave, Humayunpur requires patience and fortitude. It offers no easy burst of colour and privilege. 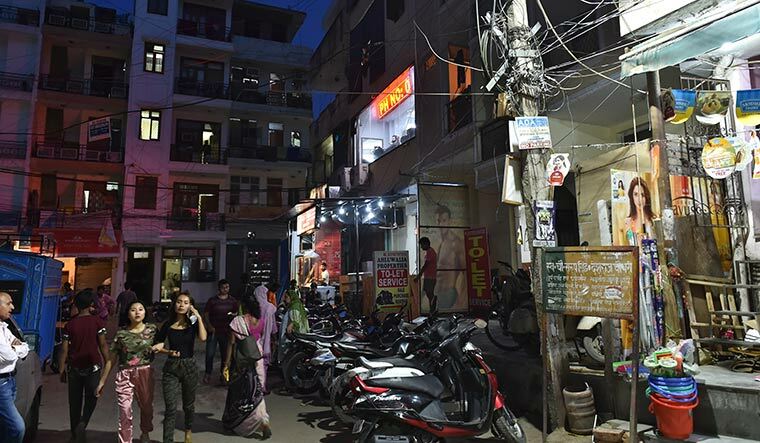 The main gateway to this urban village is a narrow passage with matchbox houses and quick-and-dirty commercial establishments, all overhung with a jangle of electrical wires and whirring flies. While Humayunpur has a cross-section of ethnicities in its tangled lanes, over the past 15 years, it has become a haven for people from the northeast. But wait till nightfall, and it transforms into a glittering underbelly of sorts, exuding the neon-infused energy of a vibrant night market. While the neighbourhood has a cross-section of ethnicities in its tangled lanes, over the past 15 years, it has become a haven for people from the northeast. The micro-hamlet derives its character from the eight sister states. “The local people know they are surviving because of us. They are getting rent from us. But, people in other parts of Delhi do not realise that,” says Poirei Yambem from Manipur, over a cup of Garcinia tea. He did his studies in Delhi and has lived in many parts of the city. But, it is in Humayunpur that he feels comfortable, safe and connected. Connected to his community, to the rest of the city and even his neighbours. Yambem, 36, co-owns a popular Manipuri eating joint, The Categorical Eat Pham (pham is the suffix for ‘place’ in Meitei language). Patrons can’t get enough of their duck curry, and for Rs 350 you can feast on a delectable concoction of river snail with smoked pork. The four-year-old restaurant is well on its way to join a legion of old daddies like Druk and Mizo Diner, other resilient favourites in the neighbourhood. For restaurants here flicker in and out of existence like fireflies. It is this consistent vibe of here-today, gone-tomorrow, which gives this place its elusive quality. On a Monday afternoon, you will suddenly discover your favourite thrift store completely bereft of clothes, save for the naked mannequins standing like creepy art installations. Next evening, while looking around for that special root onion from Nagaland, you might suddenly discover a pint-sized new bakery selling Japanese cotton cake, right next to Mummy’s Food Corner, the only place to eat sticky purple rice. A cocker spaniel puppy might saunter in from around the edges of a fluttering curtain in a makeshift changing room or a cosmetic store will cease to stock that 400-rupee charcoal face mask from South Korea. Some things never change, though. The young from the northeast continue to remain fashion-forward. There is no need for bridal boutiques or luxury designer stores in Humayunpur; it has become a fashion district in its own carefree way. Some of the best-dressed people in Delhi reside here even as they go about their day haggling with thelawalas or fronting travel agencies. You will get many reasons for people from the northeast wanting to stay on here: “It is more cosmopolitan here,” “People are more educated,” “Locals are friendlier,” “It is cleaner and greener,” “It is more peaceful and safe for women,” and “Rent is cheap.” And, these reasons don’t easily go out of fashion.